The group formed in early 2016. We usually meet on the second Monday of the month and either take a trip somewhere or have a “share your garden” meeting at a member’s home. 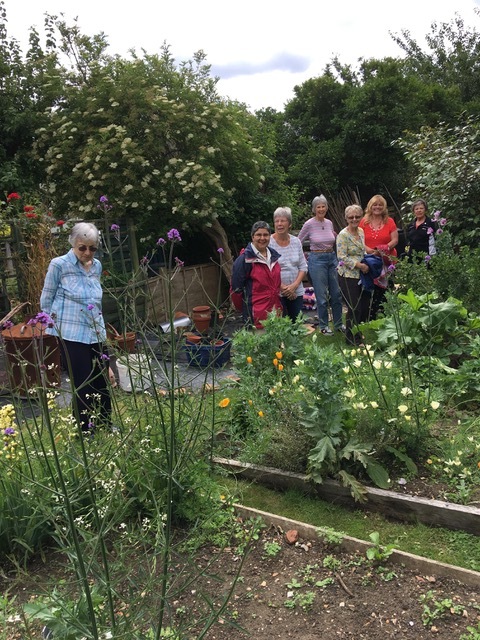 The home visits give us a chance to swap plants, seedlings or tools and have a good chat over tea sharing information about upcoming open gardens, special offers etc. While it is good to go to each other’s homes, it does mean we have restricted membership to 15 and hope that not all 15 turn up! Some of the events/gardens we visit are on other days of the week instead including Saturdays and Sundays. Our trips this year included: The Savill Garden, Chiswick House Conservatory, Heathside, a fabulous National Garden Scheme garden. In 2019 we hope to visit Timberhill Gardens which was cancelled last April due to flooding. Previous visits include: The Valley Gardens, Osterley House, The Walled Garden in Sunbury, Bishop of Fulham’s Palace, Kew Gardens, Chelsea Physic Garden, Hampton Court, Dorney Court, the Sky Garden in the Walkie Talkie building in the City and visits to a garden centre. We don’t meet in August or December. We start the year with a group lunch in January. The group has 15 members and is currently full. Please click on the blue bird on the right hand side to send an email message to the group email contact.